The Middle White pig was the pork pig of England in the 1930s. 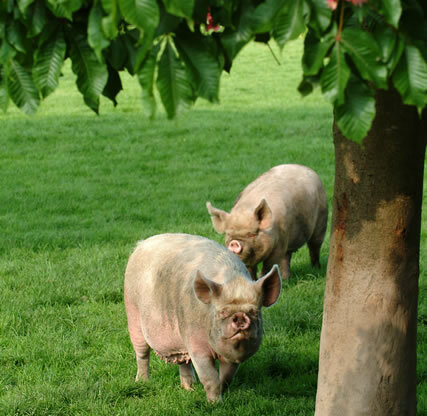 However to compete with the influx of Danish bacon after the war, farmers started to breed larger, leaner pigs for bacon. The Middle White is now a very rare breed, there are more Giant Pandas in the world! Young pigs from commercial bacon breeds now give us almost all the pork in our shops and the Middle White, which is the only specialist pork pig, is very rare. In the 1930s the Middle White was exported to Japan where the Emperor would only eat pork from Middle Whites. The Japanese have even erected a statue to this outstanding rare breed pig!